In pre-Hispanic times, the Mexica commemorated the dead during their summer months around July and August; the offerings included elements of Nature, such as fire, flowers, and part of the harvest, which in those regions of Central and Southern Mexico consisted of chili (today known around the world as: chiles, chilli, capsicum, paprika, peppers, guindilla, etc.) as well as corn, beans and squash (the well-known “three sisters” crops, all native to the Americas). Mictēcacihuātl, also known as “The Lady of the Dead”, was the female deity of the Mexica pantheon dedicated to guard the bones of the deceased in the underworld; she was said to come to the dimension of the living during this time. With the arrival of the Catholic church not long after the Spanish conquest, the angst provoked by these ancient rituals was placated with great success – during the native population’s conversion process – when combined with the observances of two days dedicated to the souls of the deceased in the Catholic calendar: the feast of All Saints, also called All Hallows’ day (November 1st) and All Souls’ day (November 2nd). To prioritize the Catholic dates, the Mexica month-long summer celebrations were also moved to coincide with these two days. Now many families in Mexico and Central America set-up offerings with a fusion of pre-Hispanic and Christian elements, in honour of their beloved deceased. The cooking and setting-up takes place at the end of October, continues with the observation of the feast of “Todos los santos” (All Saints’) on November 1st, and concludes with praying for, and visiting with, “los fieles difuntos” (the faithful deceased) on the very famous “Día de los muertos” (Day of the Dead), on November 2nd. This change of season brought winter squash into the scene as a central motif in Day of the Dead offerings; since it is customary to include something sweet, “Calabaza en tacha” – a syrupy treat of winter squash (such as pumpkin) and spices – became a traditional dish to include in offerings, and to enjoy at home during this season. In Mexico, the most popular variety of winter squash for this recipe is calabaza de Castilla, but from American influence in recent years, the celebration of All Hollows’ Eve (October 31st, AKA Halloween) has made available many party and decoration supplies: vampire fangs, cobwebs, seasonal candy, and the classic orange-skinned pumpkins. Although the big Jack o’ lantern ones are usually too watery and stringy for the kitchen, the small “sugar pumpkins” or “pie pumpkins” are ideal for this recipe. Yum! I really liked the addition of the sweet potato. This is a really sweet treat, and I liked it as it was, but I can see why some people would include guavas or oranges, to add a tangy note to the dish. I am joining What’s for Dinner? 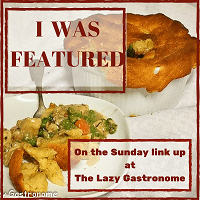 Sunday Link-up #172, with gracious hostess Helen @ The Lazy Gastronome. This Mexican sweet plate goes great with this week’s theme at Tummy Tuesday; hostess Mary @ Cactus Catz is sharing some pics from her visit to Guadalajara Fiesta Grill in Tucson, AZ. Yummy Tummy Tuesday! Hey Irene, I love stewing stone fruit in a cinnamon-flavoured, sugary syrup. It never occurred to me try it with pumpkin. That looks delicious! Thanks, Cathie! It is really good, and even more so with the sweet potatoes. It looks and sounds delicious! Thanks for sharing at the What’s for Dinner party! Have a fantastic week. Thank you, and all the best for the week to you as well, Helen! This sounds good. But I’d be in favour of an acidic tang from something like oranges too. Definitely worth a go! This looks so good! I almost have no words. It really looks so appealing! I could see it served warm with ice cream! Thank you, chef Mimi! Oooo ice cream sounds good; and with the little pumpkins, it takes less than half an hour to make. We roast, boil and put pumpkin in a soup, but I’ve never had it as a sweet before! In Mexico, it is usually summer squash the one that goes in soup. Thank you so much, and I hope you like it! Sugar pumpkins look like smaller versions of the bright orange Halloween pumpkins, also sold as “cooking pumpkins” or “pie pumpkins”; I usually see them only in the fall. I think kabocha will work, who knows, it might be even better at keeping its shape while stewing. Let me know if you get to try it!